A trio of bounty hunters chase wanted criminals through space in the original science fiction series "Killyjoys," which debuts on the Syfy network tonight (June 19). 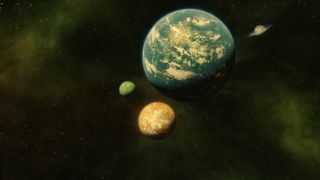 In the fictional world of "Killjoys," people travel via spaceship through "the Quad," a central planet and its three moons populated by an array of human cultures (the pilot episode features some stunning images of the system). The show's story has multiple layers, including the political issues taking place in the planetary system, and the dark and mysterious history of the team's femme-fatale leader, Dutch. "Killjoys" — which is not related to the comic book of the same name — was created by Michelle Lovretta, who also serves as the showrunner. Lovretta has worked as a writer on other shows, including "Lost Girl," "Rogue" and "Relics." "Killjoys'" main characters Dutch (left, played by Hannah John-Kamen) and John (Aaron Ashmore), are employed by the Recovery and Apprehension Coalition or RAC, which requires that they remain apolitical. The show is the second of three new science fiction series that Syfy is set to debut this year, including "Dark Matter" and "Expanse." "Killjoys'" main characters are Dutch (played by Hannah John-Kamen) and John (Aaron Ashmore), two distinctly platonic work partners employed by the Recovery and Apprehension Coalition, usually referred to as "the Rack." Its bounty-hunter employees are known as "killjoys." They live by the motto, "The warrant is all," indicating that they must fulfill their warrants at all costs, and must remain apolitical. The bounty-hunting aspect of the show allowed for a wide array of different settings and plot lines for different episodes, Lovretta told Space.com. In the pilot episode, Dutch and John are joined by John's brother, D'Avin (Luke Macfarlane), who cut himself off from family years before due to as-yet-unknown reasons. He seems to suffer from post-traumatic stress disorder. A mysterious past haunts Dutch, as well. When put under pressure, she reveals herself to be an unstoppable fighting machine, but how she gained such skills isn't made clear. However, she's being stalked by a mysterious man who may bring her past life into the present. The show will also explore political and ethical issues, particularly those related to class and overreaching government, Lovretta said (you can read more about the world of "Killjoys" here). "I think it's liberating for an audience to be able to deal with those concepts — you know ethics and politics and questions of morality — from the comfort and distance of it being from an entirely fictional reality. So we certainly have that," she said. The moon, Westerly, that most of the show takes place on was imagined as a company town, Lovretta said. Company towns are settlements that are almost entirely owned by a single company, which also serves as the majority employer or the only employer. "There's a company that actually owns the moon," Lovretta said. "And so the government sort of has say over people in a way that we would find slightly repugnant, but certainly that we don't have to look too far afield to find real-world examples of." A view from a wealthy estate in the fictional planetary system "the Quad." Issues of social and economic class play heavily into the new Syfy series "Killjoys." But Lovretta also promises that the show will have an element of fun and lightness. "A lot of times when you get more into the science fiction end […] I find that it can get a little serious and a little grim," she said. "And I have enjoyed watching those shows, but for some reason when I'm writing, my heart can't go there. I always need something that's very character based and has a sense of joy and adventure to it."